An All Honour Hand is completed with Winds, Dragons and Major Tiles of each suit. This is called when a player holds all his/her own Flower Tiles or Season Tiles. If the player holds a full set, numbered 1 to 4 (but not a combination of Flowers and Seasons), he/she is allowed to count two doubles. The player may chose to collect 500 points from each player and discard the Flower/Season Tiles, or he/she may chose to use them in the final scoring. The decision must be made as soon as the tiles are collected. If the player holds a set of Seasons from 1 to 4, and his/her own flower, the player is entitled to double his/her score three times. A Chow (meaning a run) is formed by a set of three tiles in the same suite, and numerically consecutive - 1-2-3 or 6-7-8. A clean hand is completed in one suit only, plus Winds and Dragons. A concealed hand must be all drawn from the Wall, with the exception of the 14th tile. There is one Flower Tile and one Season Tile to correspond with each Wind - and one Dragon Tile to correspond with each suit. A curtsy is performed when one wall is too far from the player opposite. The wall is pushed forward - generally using the tile rack - at the right hand end towards the opposite player, and at an angle. Dead tiles are the discarded tiles in the centre which are not immediately Pung-ed, Cong-ed or Chow-ed. These tiles are not used again during the game. This is called when a player completed his/her Mah Jong on the first discard made by East Wind. The player receives a limit, regardless of the actual scoring points in the hand. 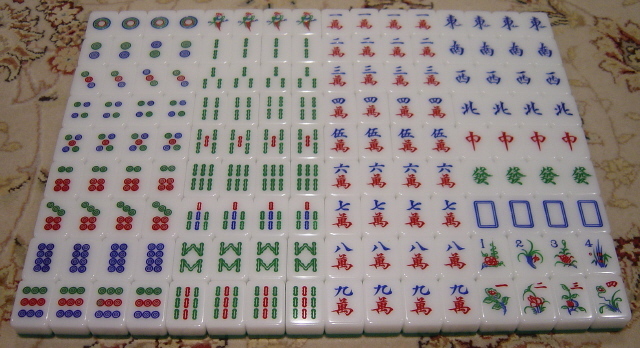 When a player has only one more tile to complete a Mah Jong, the player must declare that he/she is Fishing or Calling. The Winds and Dragons are called Honour Tiles. In some games, however, the Terminal Tiles (Major Tiles), are also included as Honours. Hop Toi is called when tiles are picked from two walls during the dealing of the tiles - e.g. : the 18th tile from one wall and the 1st tile from the second wall. It is believed to be lucky. A Kong - meaning four - is formed by four identical tiles within a suit. A Kong may be used as two pairs also. When a player declares a Kong, whether collected from the Wall or from a discard, the player must place the tiles face up on the table and take one replacement tile from The Flower Wall. This keeps the number of tiles at play to 13. A Mah Jong is called when any hand is completed. The tiles in a suit numbered 1 and 9. The Minor Tiles are numbered 2 to 8 in a suit. A player may even have a 'calling' hand after his/her first discard. The player must then declare an 'original' call. If the player does not change his hand after this call until he picks a tile from either a discard or the Wall, to go Mah Jong, the score becomes an extra double. Two identical tiles in the same suit. At the beginning of a game, East Wind is the Prevailing Wind or The Wind of the Round. East Wind retains the Wind of the Round if he has called Mah Jong three consecutive times. As soon as any other player calls Mah Jong, the Wind of the Round moves on to the player to the right. A complete game of Mah Jong is achieved when all the players have been the Wind of the Round. A Pung - meaning three - is formed by three identical tiles within a suit. When a player has two identical tiles, he may call Pung if a completing player discards the third identical tile. A Pung called by picking up a discarded tile must now be placed in an exposed position and a tile discarded. Play continues to the discarder's right. A Pung achieved by picking the tile from the Wall should be concealed and no declaration made. To distinguish a Concealed Kong - after collecting a tile from the Running Wall, place three of the tiles face up and the fourth face down on the table. If a player has made an Exposed Pung and draws the fourth identical tile from the Running Wall only, then the tile should be added to the Pung declaring an Exposed Kong - all four tiles face up. The player then draws a tile from the Running Wall and discards one. A Pure Hand is completed in one suit only, with no Winds or Dragons. A Royal Honour Hand is completed with only Winds and Dragons. Pungs and Kongs that are drawn from the Wall are placed face down and those called for from the discards are placed face up on the rack. Each of the four walls consists of 18 tiles - two rows high and build in front of each player with the tiles face down.